Gov. Scott Walker speaks at the State of the State address in Madison, Wis., held at the State Capitol building, on Jan. 10, 2017. 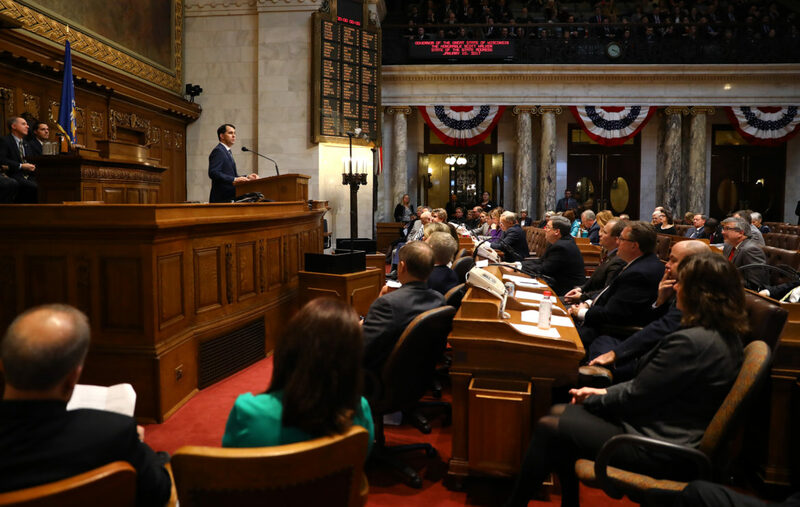 A comparison of omnibus budget motions showed both parties have used the controversial mechanism to anonymously tuck items into the state budget, but the size and impact of the items included has ballooned during Walker’s tenure. Photo by Coburn Dukehart/Wisconsin Center for Investigative Journalism. 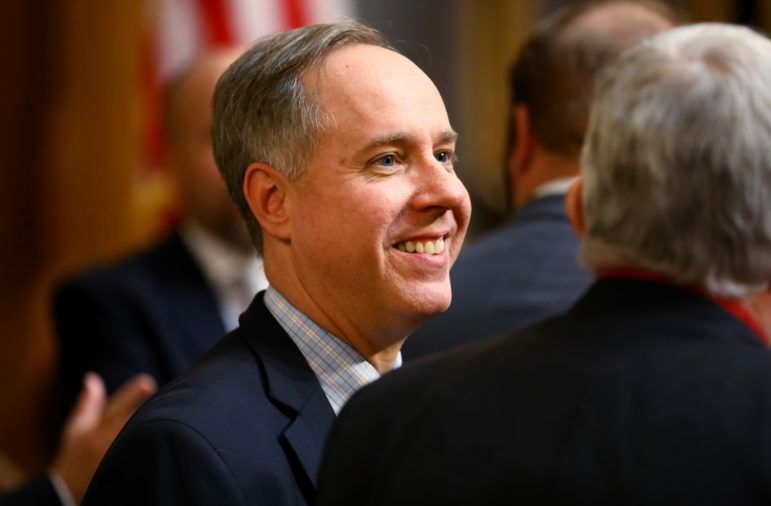 Assembly Speaker Robin Vos, R-Rochester, is seen at the State of the State address in Madison, Wis., at the State Capitol on Jan. 10, 2017. Vos and then-Republican state Sen. Glenn Grothman unveiled a last-minute massive tax cut in the 2011-13 budget that caught Democrats by surprise. Photo by Coburn Dukehart/Wisconsin Center for Investigative Journalism. — Introducing budget amendments at the end of the approval process with no public notice or debate. — Approving anonymous, last-minute budget motions containing a grab bag of changes, including major policy items that have nothing to do with state spending. — Changing the scope and impact of a bill after its public hearing has been held, which excludes regular citizens from having meaningful influence on legislation before it is enacted. Estimates now show the tax break slipped into the 2011-13 budget will end up costing the state $334 million in revenue this budget year — more than double originally projected. The tax break virtually wipes out tax bills for some of the businesses and individuals who apply for it. 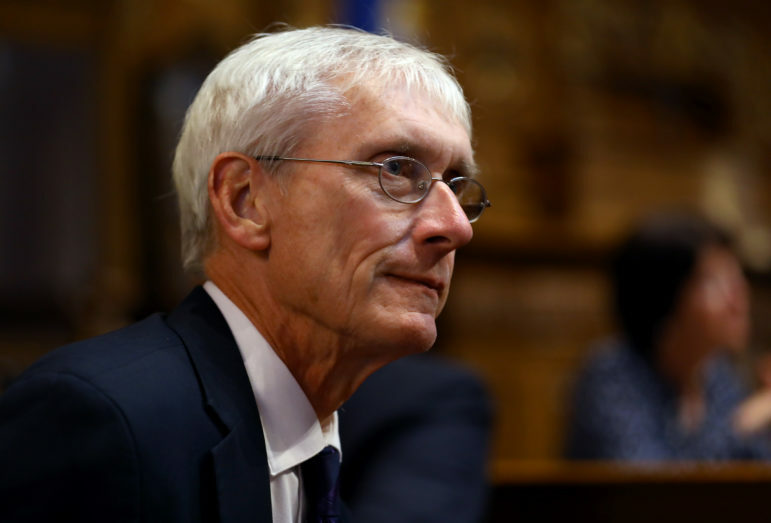 Democratic gubernatorial candidate Tony Evers has called for a tax credit passed in the 2011 budget motion to be severely curtailed, noting that nearly 80 percent the money goes to people and businesses earning at least $1 million a year. Evers, the state superintendent of public instruction, is seen here at the State of the State address in Madison, Wis., on Jan. 10, 2017. Photo by Coburn Dukehart/Wisconsin Center for Investigative Journalism. Democratic gubernatorial candidate Tony Evers has called for the tax credit to be severely curtailed, noting that nearly 80 percent of the money goes to people and businesses earning at least $1 million a year. Walker has said eliminating the credit would harm Wisconsin’s economy. Studies disagree about whether the credit has spurred job growth, with University of Wisconsin-Madison economics professor Noah Williams crediting it with creating 20,000 manufacturing jobs while the Wisconsin Budget Project cites federal statistics showing state manufacturing job and wage growth continue to be slower here than the national average. Tim Cullen, former Democratic senator who served in the Legislature in the 1970s and ‘80s and again from 2011 to 2015, says when he was a legislative leader, last-minute budget amendments included minor items. Now they are used to hide major spending and policy changes, he says. Photo by Coburn Dukehart/Wisconsin Center for Investigative Journalism. Former state Sen. Tim Cullen, a Democrat who served between 1975 and 1987 and again from 2011 to 2015, said use of these omnibus motions has changed significantly since his first time in the Senate. Cullen, who served as Senate majority leader, said in the 1970s and ‘80s, 999 motions had an informal limit of $25,000 per item and were prohibited from having broad or statewide impact. Typical items were money for the local historical society, a liquor license for a township or a gymnasium, he said. However, in recent years, these budget fixes have included sweeping measures such as the attempt to dismantle the Wisconsin Open Records Law — a proposal that was so unpopular that Walker and GOP leaders agreed to remove it from the 2015-17 budget. Former long-time state Sen. Dale Schultz, a Republican who also served as majority leader, said in the past, this wrap-up budget motion allowed each side to make minor changes to keep the budget passage moving along. Schultz, of Richland Center, served from 1983 to 2015. 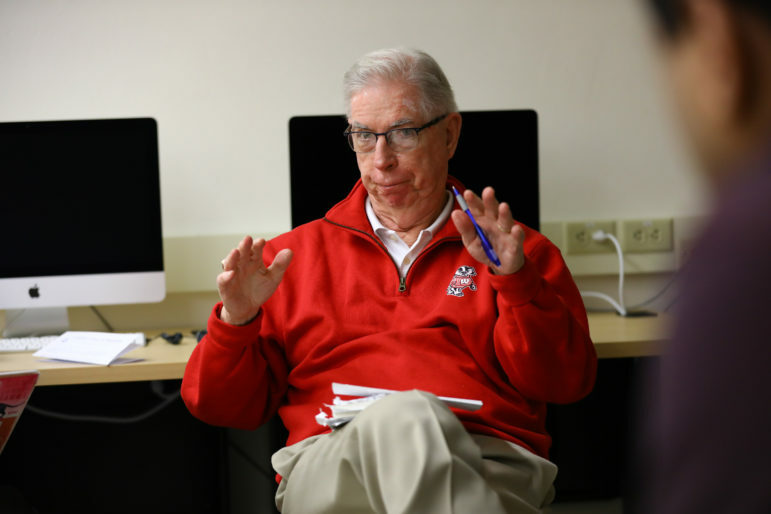 Former long-time Wisconsin state Sen. Dale Schultz, a Republican who also served as majority leader, said in the past, the omnibus budget motion allowed each side to make minor changes to keep the budget passage moving along. Schultz, who served from 1983 to 2015, said that later changed to include major policy shifts introduced anonymously. Photo by Cameron Smith / Wisconsin Center for Investigative Journalism. According to Schultz, it used to be “pretty obvious” who was backing these small-scale budget amendments. But this has changed. 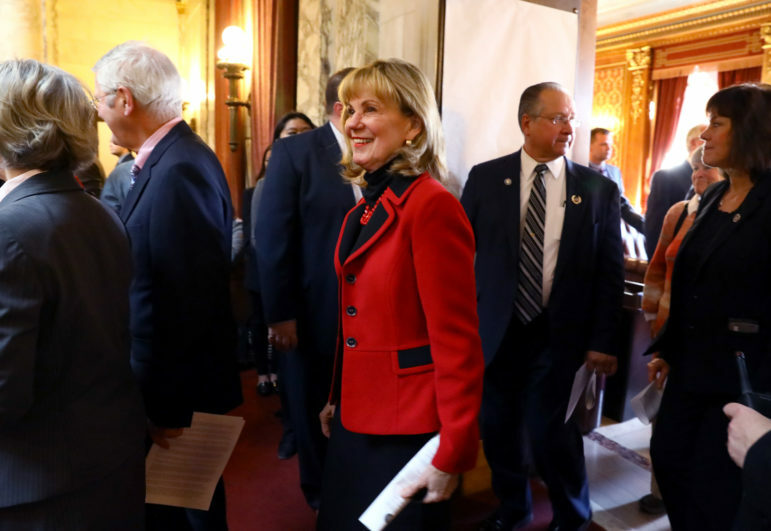 “When you decide to thwart Wisconsin’s Open Records Law, and nobody ‘fesses up as to who did it, well, how does the public have a right to know?” Schultz said of the 2015 Republican- authored 999 motion. That motion sparked a statewide public backlash that crossed ideological lines. It was the moment that conservative activist Orville Seymer parted ways with conservatives in the Legislature whom he has supported. “They tried to destroy the Open Records Law and open meetings. That was the most atrocious thing I’ve seen in years and years and years,” said Seymer, founder of Citizens for Responsible Government, a government accountability group founded during the Milwaukee County pension scandal in the early 2000s. 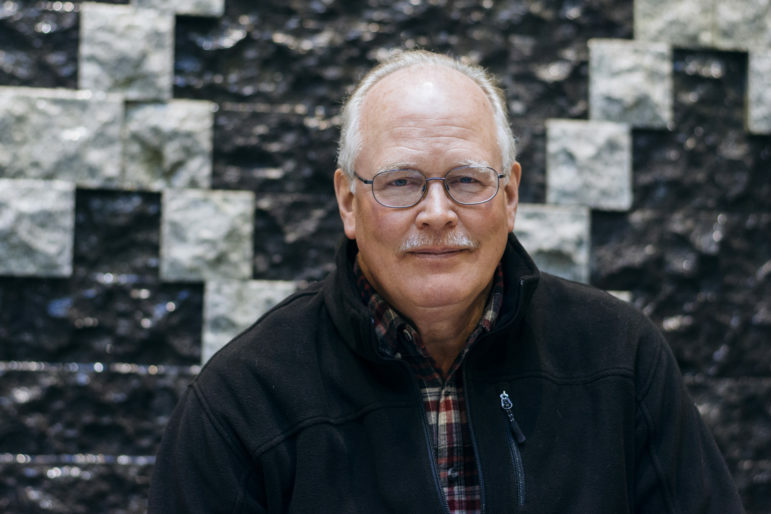 Conservative activist Orville Seymer of Citizens for Responsible Government says he was angered by the Legislature’s attempt in 2015 to eviscerate the state’s open-records law through an anonymous, last-minute amendment to the state budget. “That was the most atrocious thing I’ve seen in years and years and years.” Photo taken Feb. 27, 2018. Photo by Cameron Smith / Wisconsin Center for Investigative Journalism. “This policy, most of it, would not ever pass if it had its own bill and its own public hearing because it would be so unpopular,” added Vinehout, who ran unsuccessfully in the Democratic gubernatorial primary. A comparison of these end-of-the-session budget motions showed both parties have used the mechanism “as a hiding spot for pet projects,” but the size and impact of the items has ballooned under Walker, according to Larry Gallup, a senior editor at USA TODAY NETWORK-Wisconsin. 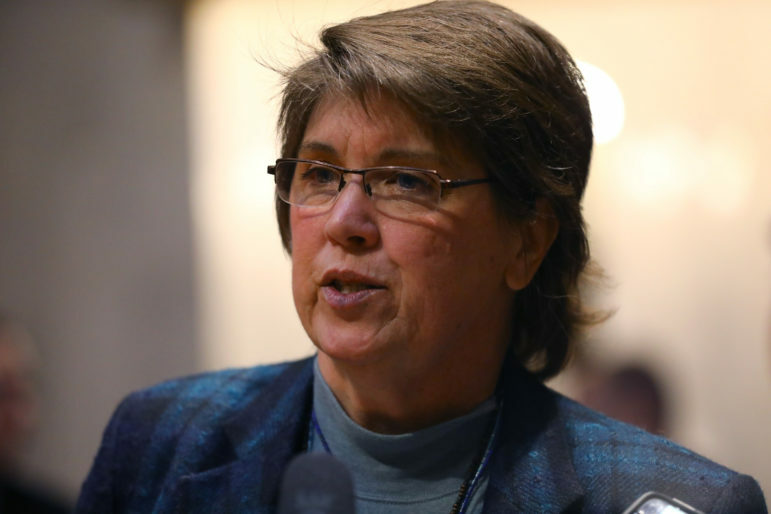 Sen. Kathleen Vinehout, D-Alma, says she has noticed in her 11 years in the Legislature an increase in the number of “different pieces of policy that have been added to the budget at the last minute.” Photo by Coburn Dukehart / Wisconsin Center for Investigative Journalism. Most legislative candidates who answered a recent poll on government openness agree that anonymous motions should be a thing of the past. In fact, all but one of the 75 legislative candidates in the upcoming election who answered the Wisconsin Freedom of Information Council poll agreed that all bills, motions and amendments considered by the Legislature should include sponsor names. The 2015-17 final wrap-up budget motion included the quiet repeal of the State False Claims Act, which a Center investigation found has cost Wisconsin taxpayers millions in lost settlements from companies that cheat the state Medicaid program. Another measure allowed out-of-state risk retention groups to sell medical liability insurance to doctors without meeting Wisconsin regulations designed to protect patients from malpractice. Risk retention groups are corporations that collect and distribute risk among policyholders engaged in the same or similar practices, such as anesthesiologists and ophthalmologists. The idea of allowing sales of such policies in Wisconsin was introduced as a bill in 2014 but died in committee. The proposal was so unpopular that despite the fact that it was introduced by fellow Republicans, top officials in the Walker administration testified against it. During the committee hearings, Julie Walsh, then a senior attorney in the Office of the Commissioner of Insurance, said Congress has prohibited states from requiring such risk retention groups to comply with state regulations, such as those aimed at making sure patients and doctors are protected if companies become insolvent. State Sen. Alberta Darling, R-River Hills, is seen during Gov. Scott Walker’s budget address on Feb. 8, 2017. 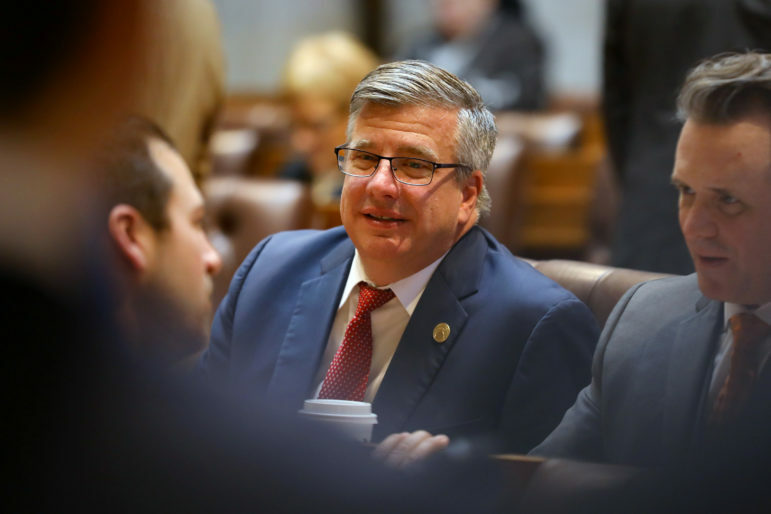 In 2017, Darling and John Nygren, R-Marinette, co-chairs of the Joint Finance Committee, said they were working to prevent the use of an omnibus motion that includes a grab bag of anonymously authored items at the end of budget deliberations. But when the 2017-19 budget was passed in September 2017, the two again authorized the final motion to make last-minute changes without public input. Photo by Coburn Dukehart / Wisconsin Center for Investigative Journalism. One year after the bill was killed, it quietly re-appeared in a 999 motion. The drafting files at the Legislative Reference Bureau for the original 2013 bill reveal one possible reason it was resurrected from the dead. The records show the co-chairman of the Joint Finance Committee, Rep. John Nygren, R-Marinette, had requested the bill be drafted after being contacted by Eric Jensen, a lobbyist for the private, out-of-state risk retention groups Ophthalmic Mutual Insurance Co. and Preferred Physicians Medical Risk Retention Group Inc. The co-chairwoman, Sen. Alberta Darling, R-River Hills, authored the companion bill in the Senate. According to an email from Walsh in the drafting file, out-of-state companies had been given options for becoming licensed in Wisconsin but sought to avoid the state’s patient-protection regulations. Records show the official co-sponsors of the motion 999, Darling and Nygren, who works in the insurance industry, together received donations from representatives of Ophthalmic Mutual Insurance totaling $1,250 during the 2015 budget season. According to the Wisconsin Democracy Campaign website, Ophthalmic Mutual has not recorded donations to any other Wisconsin legislator before or since. State Rep. John Nygren, R-Marinette, is seen at the State of the State address at the Capitol in Madison, Wis., on Jan. 24, 2018. Nygren is co-chairman of the Joint Finance Committee. He said the budget bill is “the most publicly debated and scrutinized bill the Legislature passes during the session.” Photo by Coburn Dukehart / Wisconsin Center for Investigative Journalism. He defended allowing out-of-state risk retention groups to sell policies in Wisconsin. Such companies “help manage liability costs for health care providers which, in turn, helps control costs for patients,” Nygren said. In 2017, Nygren and Darling said they were working to prevent the use of the controversial motion. But when the 2017-19 budget was passed in September 2017, the two again authorized the final motion to make last-minute changes without public input — including items that had nothing to do with state spending. They included loosening standards for setting up charter schools and requiring state universities to track how many hours each instructor teaches. 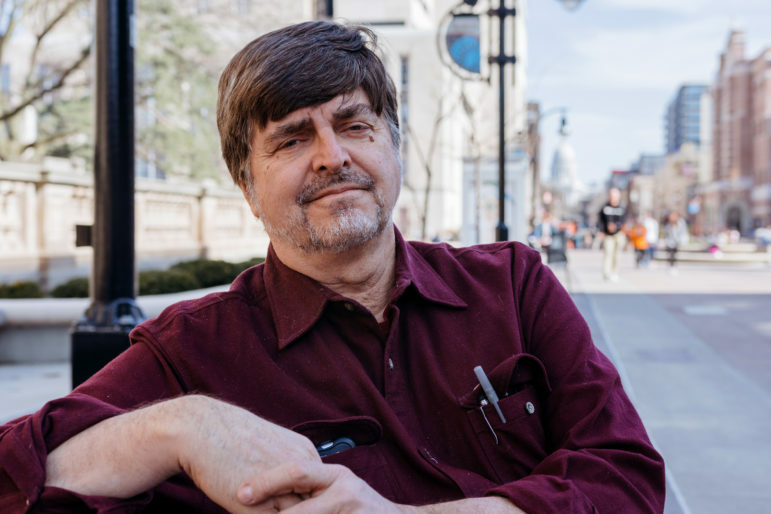 Barry Burden, professor of political science at the University of Wisconsin-Madison and director of the Elections Research Center, said budget bills are a favorite hiding place for unpopular legislation. 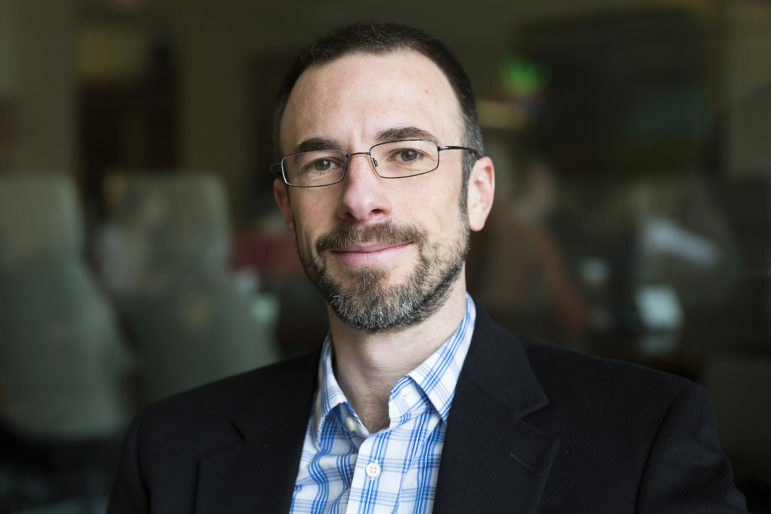 Barry Burden, professor of political science at the University of Wisconsin-Madison and director of the Elections Research Center, says budget bills are a favorite hiding place for unpopular legislation. “We know they (budget bills) have to be passed,” Burden said. “That’s when members try to slide in all of the things they thought might not pass on their own.” Photo courtesy of Barry Burden/WICJ. He added that the anonymity of the 999 motion is politically enticing because it avoids public scrutiny. The majority party can “bury” unpopular items in bigger motions. “Everyone can say they were against that little thing that was added in the 999, but the bill — they voted for the larger bill. We’ll never know exactly what their stance was on those items,” Burden said. In November 2017, the Kansas City Star published a months-long investigation documenting corruption, secrecy and suppression of public input in state government. The newspaper found that more than 90 percent of Kansas laws over the past decade began as anonymously submitted bills, meaning the people of Kansas typically did not know who introduced the legislation or why. Vinehout said many interests, such as the rent-to-own industry, have begun to exert more influence over Wisconsin’s budget-making process because of this secretive technique. “The problem the Legislature faces now is that the groups, these shadow groups, have much more power to be able to get pieces of policy that they want into the budget, and that is a way to obscure what actually has happened,” she said. 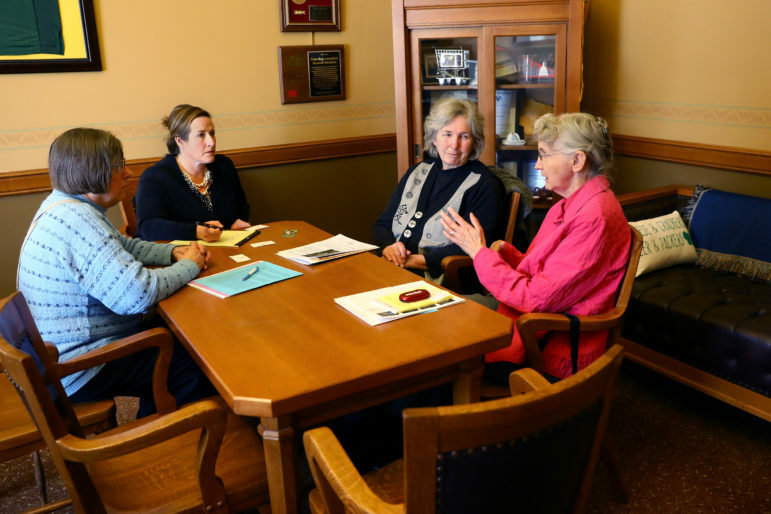 Sinsinawa Dominican Sister Pat Davis, right, along with former Madison School Board member Mary Kay Baum, right center, and Joan Duerst from MOSES, left, meet with Katy Prange, chief of staff for Sen. Howard Marklein, R-Spring Green, to advocate against Senate Bill 54 on March 13, 2018. A $350 million prison was added onto the bill, which proposed changes to probation and extended supervision. The bill did not pass when the Senate declined to take it up. Photo by Coburn Dukehart / Wisconsin Center for Investigative Journalism. These are bills introduced with one purpose, but later amended to do something entirely different — often after public hearings have ended. Burden said Congress is notorious for adding last-minute, unrelated items to the budget — a bill that must pass for the government to operate. Members try “to stick things in about immigration, about abortion, about guns, about a train tunnel in New York that all are worthwhile things to debate, but they just see that this is the vehicle that could pass them,” he said. The same thing happens in Wisconsin. One such Body Snatcher bill, Senate Bill 54, was introduced in February 2017. The bill as originally introduced would require the Department of Corrections to recommend revoking extended supervision, parole or probation if a person is charged with a new crime. A group of citizens gathers at the Wisconsin State Capitol on March 13, 2018 to protest the inclusion of a $350 million prison on a bill that would have made unrelated changes to Department of Corrections’ policy on probation and parole. The prison measure — added after the public hearing — would have resulted in the first new prison in Wisconsin in 17 years. The Senate declined to take up the bill. Photo by Coburn Dukehart / Wisconsin Center for Investigative Journalism. One year later, in February 2018, SB 54 was amended by a group of Republican legislators led by Rep. Joe Sanfelippo, R-New Berlin. The amendment added construction of a $350 million prison. It would have been the first new state prison built in Wisconsin in at least 17 years. Despite a year of deliberation on the original bill, the measure was amended and voted on the same day in the Assembly — with no chance for public input. 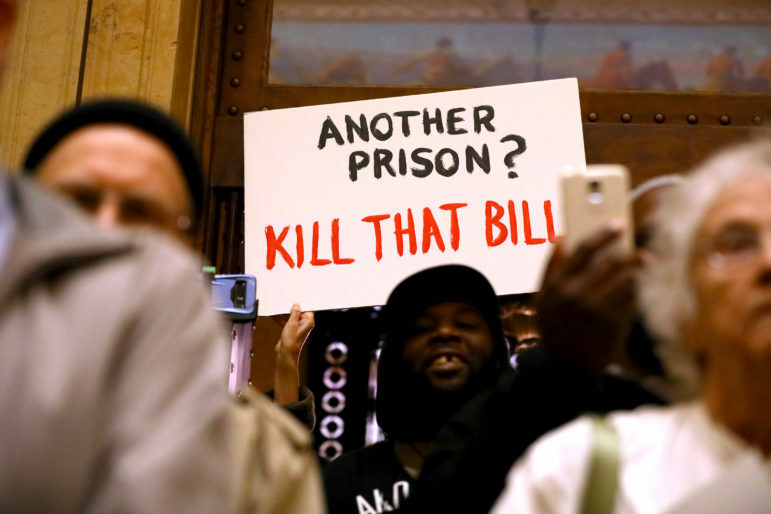 The prison amendment was “grafted” onto the bill during a “packed three-day Assembly session where many bills were discussed and voted on, and a lot of people missed that it happened,” said Molly Collins, advocacy director of the American Civil Liberties Union of Wisconsin. Opponents of a last-minute addition of a $350 million prison to Senate Bill 54 gather on March 13, 2018 at the Wisconsin State Capitol. The group of about 100 citizens met for an information session about the bill and then lobbied senators to vote against it. The bill failed to pass after the Senate declined to take it up. Photo by Coburn Dukehart / Wisconsin Center for Investigative Journalism. 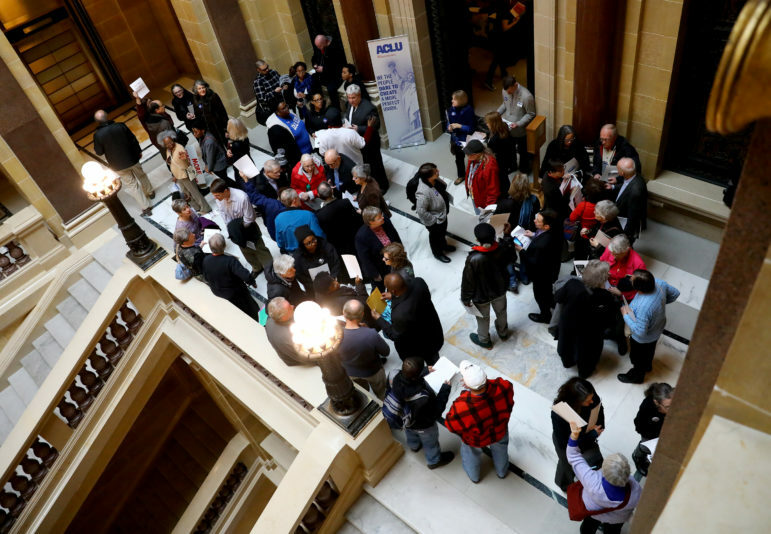 In the end, the ACLU and more than 50 other groups mobilized a campaign and transported protesters to Madison to lobby against the bill in the Senate. It failed to pass when the Senate declined to take it up. Congratulations to the Wisconsin Center for Investigative Journalism and Dee Hall for this outstanding article. All members of the media in Wisconsin would do well to pay close attention to their work.